Ever since the end of World War II, one powerful individual has held this patchwork Balkan nation together. Europe could be in for tumultuous change in the post-Tito era. 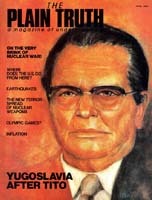 Europe's last great national leader in World War 11- Yugoslavia's President Josip Broz Tito - lies near death, as this article goes to press. Tito's 22 million countrymen are deeply concerned, especially in the aftermath of the Soviet move into Afghanistan. In the post -Tito period, will Moscow try to force communist but independently communist - Yugoslavia back into its East European satellite empire from which it was expelled in 1948? If so, will Belgrade be forced to look elsewhere, especially to the West, for protection? The world - and especially Western Europe-anxiously awaits the answer to these questions.